The Chameleon 144 Fiber MTP Brand Trunking Cable provides a high density fiber distribution solution to the space conscious data center manager. As storage solutions and fiber management needs grow, data center space becomes more and more precious. 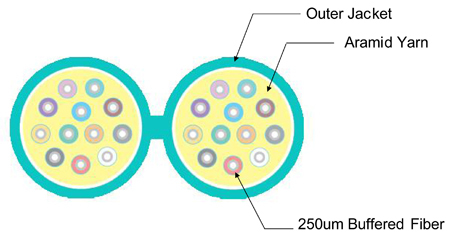 In the Chameleon Trunking Cable, two 72 Fiber MTP brand cables are packaged together in a single “shotgun” style jacket, making the cable flexible given the fiber density. Less bulk means more airflow, more manageability, less headaches. Each cable is intended to plug into the back of a Chameleon High Volume Cassette Module for maximum bandwidth. The trunk and cassette module, when combined with our patent pending patching system, eliminates crosstalk amongst fibers so you can be sure your data will not be corrupted due to interference. 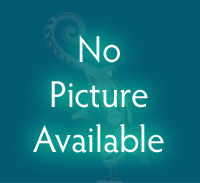 The above represents typical distribution in the back of the chassis. The strain relief modules for each cable are secured into place on each side using specialized brackets. 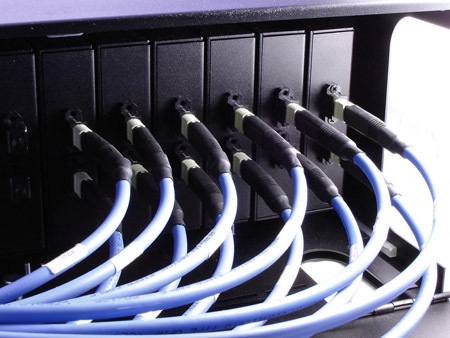 A strain relief module is provided with each 72 fiber branch allowing for easy cable management. The Chameleon chassis allows cables to be fed in from the top, bottom, sides, or the back and secured with brackets engineered especially for this purpose. The brackets isolate the strain relief modules and route the cable directly to the MTP brand cassettes. 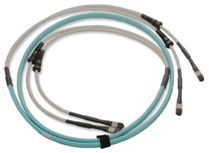 Due to the maximum bend radius of the cable, in high‐density solutions this configuration is a necessity. Pictured to the right are the strain relief modules that are prefabricated around the cable. They can be moved along each branch depending on your application. They allow the cable to be distributed with ease while maintaining secure cable routing. "...Less bulk means more airflow, more manageability, less headaches." 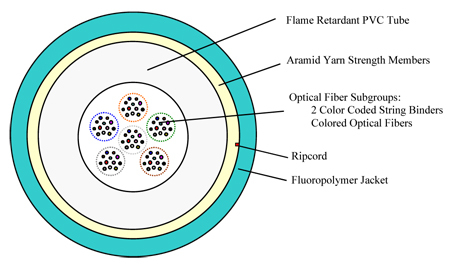 In the Chameleon 72-strand Trunking Cable, one 72 Fiber MTP brand cable is packaged in a “shotgun” style jacket, making the cable flexible given the fiber density. Each cable is intended to plug into the back of a Chameleon High Volume Cassette Module for maximum bandwidth. The trunk and cassette module, when combined with our patent pending patching system, eliminates crosstalk amongst fibers so you can be sure your data will not be corrupted due to interference.